Vytautas Magnus University (VMU) is a classical university of liberal arts which pays a particular attention on the internationalization of the studies and research. It is one of the most international universities in Lithuania and the wider Eastern Europe and Baltic region. Every year an increasing amount of foreign students has been coming from European, Asian and American continents to study here. What are the main reasons of their choices? 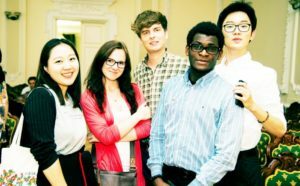 Why do foreign students choose studies in VMU? About the choices and experiences – we speak with the students, who came from the very different countries (USA, Morocco, Ukraine, Georgia, Venezuela and Turkey) and decided to study “International Politics and Development Studies”, one of the most popular bachelor level program among foreign students. Olivia Wells: I was studying at University of Southern California and I did an exchange program to Greece. After spending a year in Greece I decided that I wanted to switch my major, which was classics, to international relations. I also wanted to stay in Europe, so I did a lot of research about programs in English in Europe in political science and international relations. VMU fit my requirements and it was also very affordable for me. That was a huge factor. As it is known, studying (especially getting your undergraduate degree) in the US is ridiculously expensive. The financial aspect of my studies was very important. Nikoloz Chkheidze: There was a correlation of few factors that motivated me to come and study in Lithuania. Firstly, finishing studies in Lithuania would have been more recognized and accredited worldwide rather than finishing studies in Georgia. Secondly, the prices were more convenient and attractive than those in Western Europe, and lastly my Lithuanian friends that I have made in school period – made me decide to come to study in Lithuania. Anna Romanenko: It was a great opportunity to study abroad and to get an international diploma, because the diploma from Ukrainian universities is not so recognized in the European countries. It also gives me a great opportunity to get a perfect job. 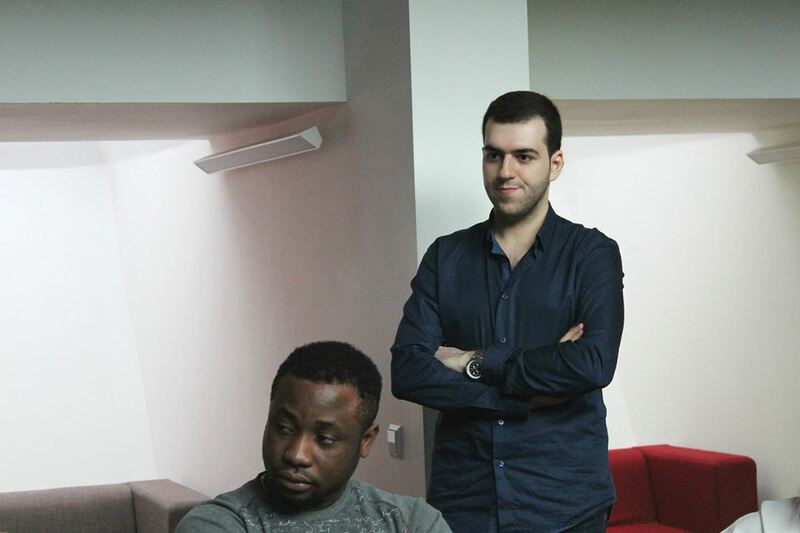 Muhammed Nas: Actually, my main motivation to come to Lithuania was because it is really affordable and my plan was to transfer my credits from Lithuania to the United Kingdom but I saw that I really achieved very good success at Vytautas Magnus University, so I decided to stay here. Olivia Wells: I realized the benefits of staying in Europe while studying international relations. You’re sort of in the middle of everything that’s going on. It is also really interesting to study in this part of Europe considering Russia and the dynamics of the Cold War, which is an important aspect of international relations. I didn’t have a lot of preconceived notions about Lithuania. You have to understand that in the US it’s very much grouped with the other Baltic States and Eastern Europe in general. So when we study what happened in this part of the world, we don’t go into the individual states. It’s very much monolithic block vs. Russia and how Russia interacts with Eastern Europe as a whole, which is unfortunate, but it’s true. M.Zakaria Belmehdi: Why exactly Lithuania? Because, first of all, I want to study in Eastern European country, because of the culture, because of history- these are the first factors that attracted me. For me coming to Lithuania was not challenging in comparison to the UK. As concerning integration with people, for me it was easy here, because Lithuanians are open-minded. So, I do not have any problems, as far as I want to integrate. Of course, there are little challenges, but in general, my experience was very positive here. Before coming to Kaunas, I had a concern, because the population of Kaunas is 98 per cent Lithuanians. On the other hand, I wanted to live in a homogeneous country meanwhile having some multicultural experience. I met many friends and people from different countries not only from VMU, but from other universities as well. For me, Kaunas is really suitable for a student life since there are a lot of activities, at least during the academic year. Muhammed Nas: Kaunas is a beautiful city. It has a warm environment and very beautiful green places and historical places as well. Actually, the people are nice, multicultural communication is very vivid here and I totally agree that it is a student city. Here there are more than 3 universities, hence it includes very different types of nationalities and thus these international students make the city more rich culturally and colorful. Nikoloz Chkheidze: I would agree, not only that Kaunas is full of international students, but it is also a city, where a lot of Lithuanians come from other parts of their country – this makes Kaunas a multicultural student city. Konrad Petraitis: Sometimes while walking the Liberty Avenue you feel how quite it is. That was new experience since you would never ever experience that in Venezuela. You could be in the middle of nowhere in Latin America and you still hear people screaming and shouting. That’s why people here look at me weird if I talk more loudly. So Lithuania taught me the difference between talking and shouting, and inside and outside voices. Although Lithuanians are quiet, but they are very curious as well, so they do want to get to know foreigners, they do open a lot of doors for you. With some of Lithuanians I even get along better than with my siblings. Anna Romanenko: Lithuania is not so far from Ukraine and we share some common history such as the Soviet period, so sometimes I can talk in Russian with adults, because a lot of older generation people know Russian and it is really helpful for me. So I didn’t really feel like in a completely different environment. Ukrainian Anna Romanenko will seek to apply the university knowledge in her country after graduation. Nikoloz Chkheidze: The friendly acceptance coming from university staff, teachers and students of Vytautas Magnus University made it much easier to adapt. Together with my friend, we were always feeling the support coming from locals in anything we needed whether it was something related to university or a completely different issue. The atmosphere is amazing in the university, no matter how involved and active you are, it makes you feel to be part of it, as the city is also small and full of students, this makes the inside of university even more comfortable and cozy. The constant movement of flows of people in different buildings makes you alive and motivated to go out and do something. The university offers you opportunities such as doing an Erasmus abroad and participating in many local and international events of political scope. Konrad Petraitis: I applied for several other universities but VMU just convinced me, honestly, the treatment I got here just applying, really, it took me over, I can’t complain. VMU kind of hit the tone with me, they are very relaxed people, they are very down to earth, they provide you with the tools to succeed and if you don’t want to take them, it’s up to you. But VMU invented itself so, that you not only take them, but it would do everything for you. I have that impression, which, I assume that some people need more than the others. M.Zakaria Belmehdi: University atmosphere is friendly, international and funny. Friendly because both Lithuanians and foreign students that I’ve met here are really friendly, open-minded and open to other cultures, so we have a lot of cultural exchanges. It is really easy to make friends here. It is really international, because there are foreign students from around 50 countries. Although the majority of them are from Europe, there are students from outside Europe as well. Moreover, university has a lot of student clubs, which help students to have fun, to relax, enjoy his moment and time here in Lithuania. Olivia Wells: I like it and I was very surprised by it. There are definitely things that need to be worked on, however, I like that it’s smaller because I’ve been in smaller and very large universities and in larger universities there’s a gap between the students and the administration. You don’t feel like you can easily approach any of the staff and it’s very bureaucratic, so it’s difficult to get anything done. I’m really grateful that it is easy to talk to people here and they are helpful. I liked the administration – from there I decided that I wanted to get involved in different extra curricular activities. It’s quite easy to do all these extra curricular activities and if you are the kind of person that wants to get involved, it is a great school for that because the university really supports students’ initiatives. 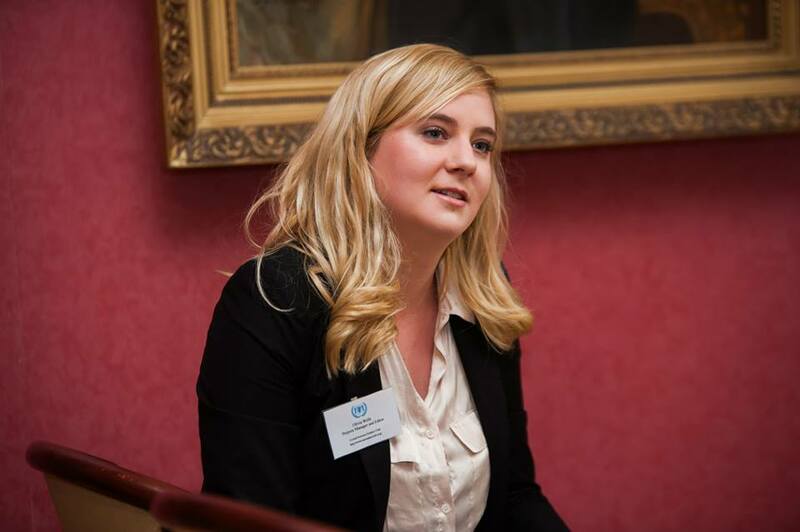 Anna Romanenko: From the first letter of acceptance and even starting from when I sent my documents to the international office, I was really happy that they were speaking to me warmly, they were really friendly and when I came the environment was also very friendly. Also Eglė, from International Office, really helped me a lot in the beginning, and even now, when I have some questions, she is always happy to help me without any problems. Muhammed Nas: I tried to be as active as possible. So, during my studies I did a lot of initiatives. One of them was the establishment of United Nations students club. After the meeting with the UN Secretary General Ban Ki Moon, who visited VMU, we decided to establish this organization. Within the activities of this student organization we widely announced our university name while communicating with diplomatic representatives, especially in the Embassy of Sweden, the Embassy of Republic of Turkey, the Embassy of the USA and so on. So people really appreciate our initiatives. So after achieving this, I decided to stay here, I had very good success which is going to be very useful for my future life. Olivia Wells: Simply speaking about my knowledge base, it has really expanded, that’s undeniable. I could also say that I’ve been the most active as a student in university life and involving myself in extra curricular activities than I ever was in the US. So that has been really great for me. I was able to work and do a lot. Of course, it depends a lot on the person. Nikoloz Chkheidze: It gave me also a better understanding of myself, my strengths and weaknesses as well as it determined me more as a person, knowing exactly what I want and what to strive for. By choosing to study in Lithuania, I believe I made a very good choice and I am satisfied. The program turned out to be exactly what I was interested to study. Konrad Petraitis: It gave me a lot more that I could ever express in any interview. I am eternally indebted to this university, to every single professor, to every single staff member and it is going to be my alma mater forever. VMU will give you every single thing to you to succeed and it’s only up to you whether you’re willing to take them. You will have to work, play your part, but as I said, VMU has that big fish in a small pond mentality that helps people to succeed. M.Zakaria Belmehdi: When it comes to this particular study program, for those, who wish to study politics, I definitely recommend them to come to study here. Also, people who are looking for fun, for good quality of education and international environment- I recommend them to come to VMU. 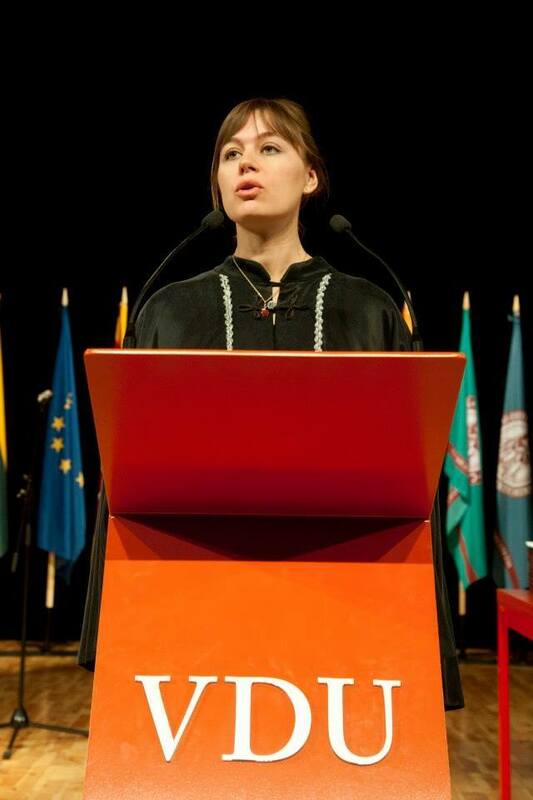 Anna Romanenko: When I came to the faculty of Political Science and Diplomacy I was really surprised by the level they are teaching, because the level of English of lecturers were really good, they are helpful and the lectures are interesting for me. I understood that I am happy to be here and I’m lucky to study in such a university. In the beginning it was really difficult for me due to everything was in English, every lecturer wants something from you, and you need to write and read a lot of, hence the first year was really challenging for me. But then I started to develop myself and improve my language and communication skills, I started to read more. So I believe I really grew up as a person. Muhammed Nas: I had very intelligent and professional lecturers, who are open-minded, informative and smart. This study program is a comprehensive, the content of the program is acceptable by other universities worldwide and it includes very good topics. Besides of being a good political scientist, you can increase your knowledge and it really contributes to your life, because you can select very different type of elective courses such as Media Art, Philosophy, Biology and so on. So I really call people, who want to study political science to come here. If they are going to struggle, because if there is no struggle, there is no achievement, if they are going to study hard, VMU is very international university and therefore they will achieve the goals. Dr. Sima Rakutienė: „ There is no question that multicultural environment creates opportunities not only to know, but also to feel and hear the voices of different peoples and cultures right here in the classroom, to study international politics in the international community, to analyze the effects of global importance, socio-political and economic processes. 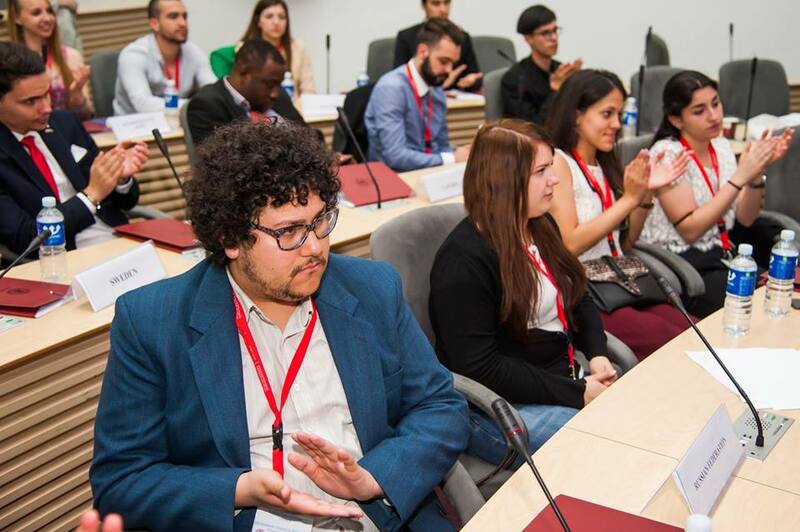 Each year the program attracts foreign students from various parts of the world (Morocco, Venezuela, Ukraine, Georgia, USA, Nigeria, turkey and etc.) and creates an invaluable intercultural environment and experience for both: teachers and students“.